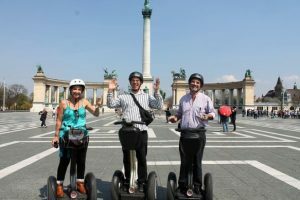 Visit Szechenyi Spa & Baths in style: discover the City Park attractions in Budapest on a 1 or 2 hour guided Segway Tour, then enjoy a relaxing day at Szechenyi Baths. There are multiple attractions included in the tour route: from Andrassy Avenue through the picturesque Vajdahunyad Castle to the Art Nouveau Zoo. Group discounts for 10 or more. You can save approx. 5 Euros on your Szechenyi Bath entry in the package price, which adds up to a fast track online ticket with a private changing cabin and a guided Segway Tour of 1 or 2 hour. 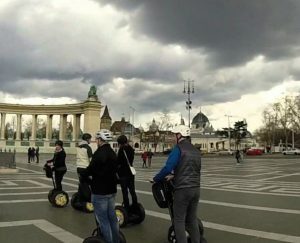 Before you book this package of Segway Tour and Szechenyi Bath Ticket, please read the detailed T&C’s for Segway tours on Budapest Segway Tour: Segway Terms & Conditions. I want to book a Segway tour (2 hours) for myself and my 12 year old son, and combine that with the baths. Since the Segway tour is less expensive for a 12 year old, is his combined ticket less too? I’m afraid the discounted Baths & Segway tour package does not have a special student or child price. Thank you for your understanding. Hi..we are 16 people..arriving budapest on 15may. Want to know details for the tour..cost. adult 13+ 3 kid of 9,9,12yrs. Kindly send details for booking payment and confirmation for probably tour on either 17 or 18 th may.